If you are going to the movies then you definitely would prefer snacks to bring with you. We usually go to the movies at SM City Baliwag and we never go to the movie without a popcorn. The popcorn that best suits our taste for movies is Popperoo. Popperoo comes in three flavors: Barbecue, cheese and butter. The most tasty, well at least for Mei is butter but for me I generally prefer barbecue flavor. Popperoo is very affordable. The bucket size is only P60 and their smallest size is around P30. I give 5 for uniqueness since this product is nothing unique except for the good taste that it offers compared to other popcorns available at SM Supermalls. Product access is also at 6 because it is not available in your regular sari-sari store. 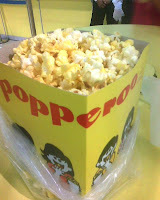 So if you want to watch a movie and you like Popcorn then I suggest you buy Popperroo.